This article gives you complete details about Thomas Muller from Germany who is one of the young player from German football team. More details about the biography, profile and awards won by Thomas Muller are also quoted in this article. Read the article full for more details Thomas Muller. Thomas Muller is the best young football player in Germany. 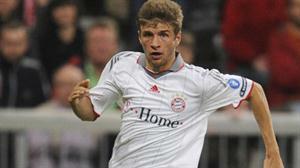 Thomas Muller was born in the year 1989 September 13. Thomas Muller was born at Weilheim, West Germany. Thomas Muller will play as midfielder and forward for Germany. Thomas Muller is an attacking midfielder and striker for Germany. With his best performance in 2009, Muller was selected in German team for 2010 Fifa world cup. He scored 5 goals in the tournament. Thomas Muller was awarded Best young player of 2010 fifa world cup and golden boot for top scorer in 2010 fifa world cup. His International career begins in 2004 where he was selected for under 16 Germany team and in 2009 he was a member of under 21 squad. Muller is currently looking and focusing on Euro 2012 and Germany was qualified for 2012 Euro. Muller scored 7 goals in Euro qualifiers. Thomas Muller was married to Lisa in December 2009. More details about the profile and awards won by Thomas Muller are given below.